It’s almost Thanksgiving! So let’s do a Christmas treat! Doesn’t Thanksgiving always get the shaft! 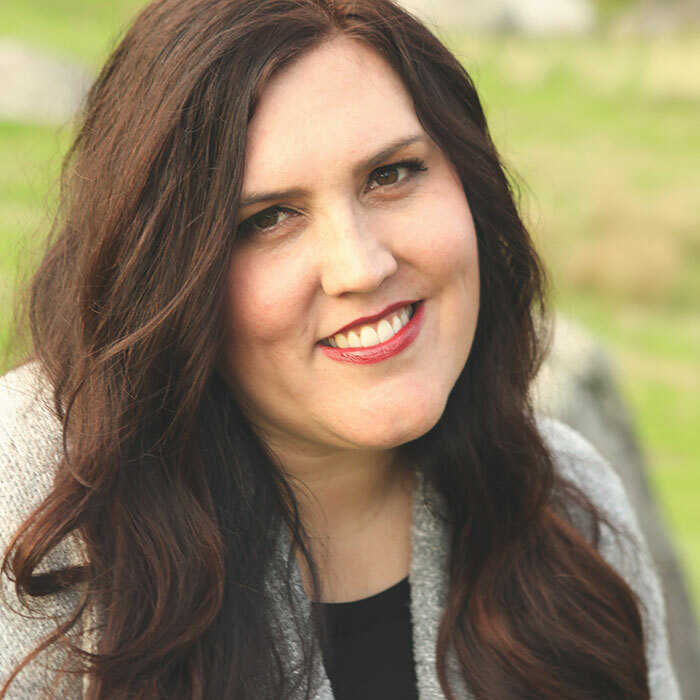 I won’t skip over the holiday without telling you readers that I’m thankful you stop by this old blog. Even when life with kids, jobs and responsibilities get in the way, you are patient! And even send me nice emails! Thank-you! 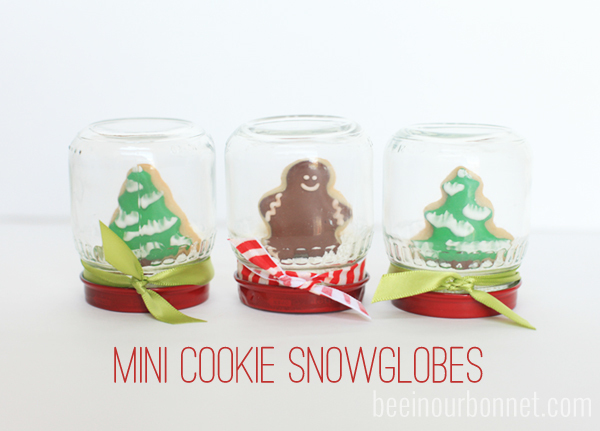 But if you’re ready for some Christmas, check out my little cookie snow globes I made. I originally posted these over on I Heart Naptime a few weeks ago. 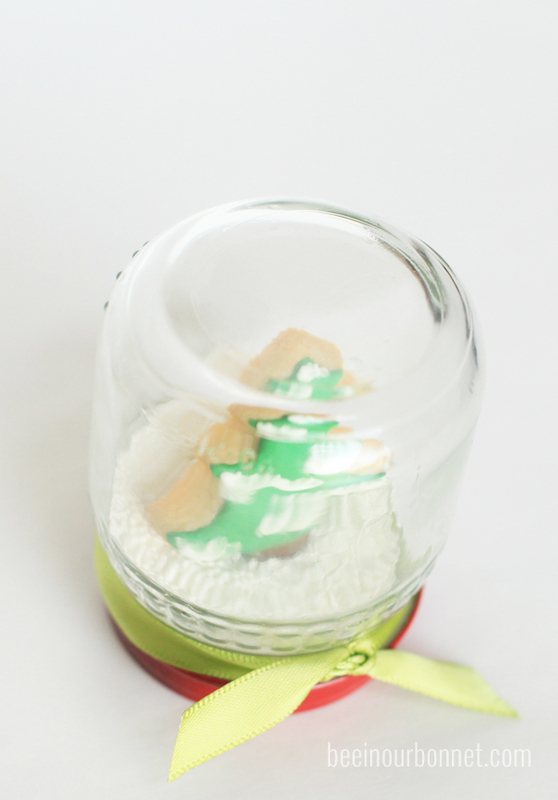 Did you check out Jamielyn’s awesome collection of Christmas projects? It is a must! My top recipe to try this season is her Christmas Crack. Looks crazy good! 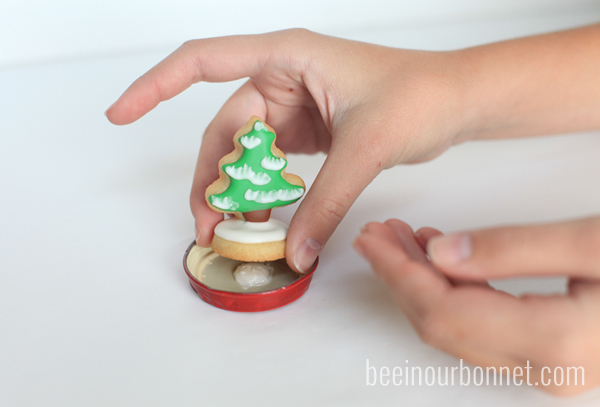 Now onto my edible decoration… This fun little treat combines some of my favorite things: Decorated cookies, snow globes at Christmas, and mini-anything! These little cuties can be used for favors, a kids craft, or even place-holders if you added a tag with a name. They’re shakable AND edible! 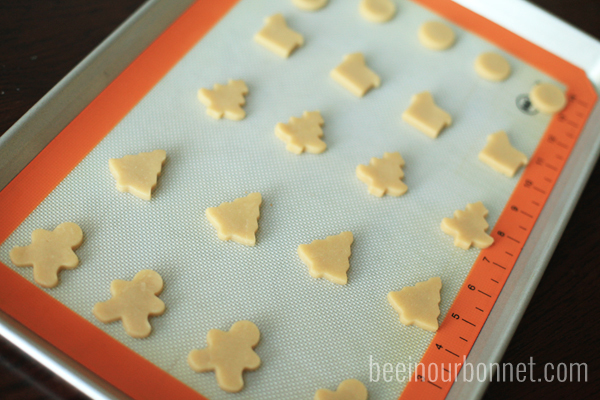 You can get started with your favorite sugar cookie dough, or use my sugar cookie recipe here. 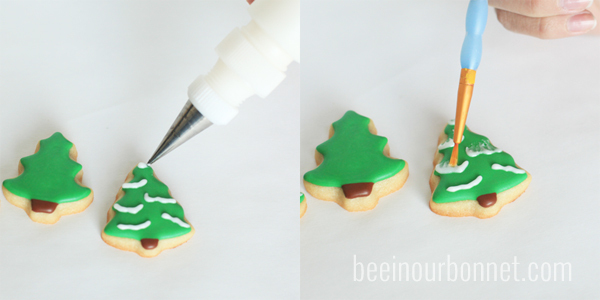 I used the Wilton mini Christmas cutter set that you can find in the baking aisle of most craft stores. 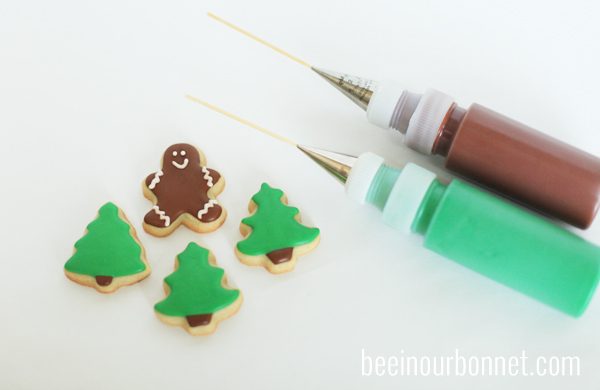 In that same post, you will find my recipe for royal icing and some instructions on how to decorate with it. 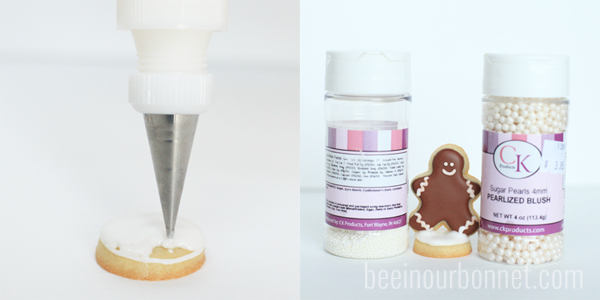 This project is so simple, it’s great for beginners and experienced cookiers alike! After your main color dries for a couple of hours, you can add a bit of detail. 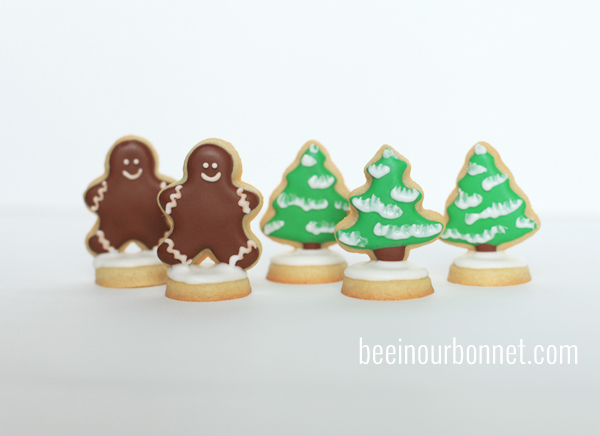 I added a face to my gingerbread men and some snow to my Christmas trees. I used a clean paintbrush on my wet icing to create a fun look. If you would like to learn more about the brush embroidery technique, go here. Next it’s time to make a little stand. I used a small 1.25″ cookie as the base. I frosted it, then proped my dried cookie on top. I used sprinkles, cans and whatever I could find to hold it there while it dried for a few hours. I was ready with my simple mini Christmas cookies and then I put to use some baby food jars I’ve been saving! If you don’t have baby food, you can use other small-ish jars like the ones that artichoke hearts come in. Or… Why not a full sized cookie and full sized jar? I’m not stopping you! I just wanted to do mini’s today! I put a dab of royal icing on the jar lid to keep my little tree in place. This will make it shakable! 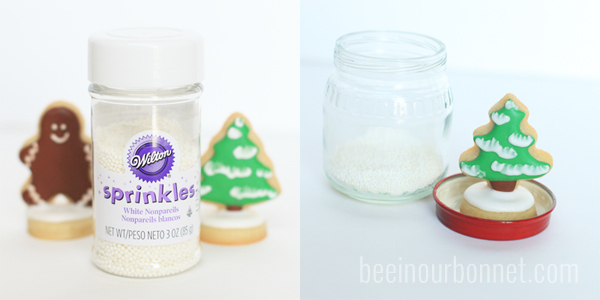 After that dried for a short time, I poured some white, nonpareils in my jar, screwed the top on and flipped it over. The finishing touch was a little ribbon around the base of my jar! My daughter made these along with me and had a lot of fun. She declared that she wanted to make them for all her friends! Whether you make this treat for kids or with kids, it’s a lot of fun! It’s also fun to take the lid off, pull the cookie off and eat it up! They didn’t last very long around here. But I do think I’ll make another batch for our holiday table. I’m thinking I can incorporate a name somehow and use it as a place card holder/take home treat. Yes, that is the plan. A perfect holiday table. Christmas is looking really good in my head. Now, to pull it all off… I’d better get going! 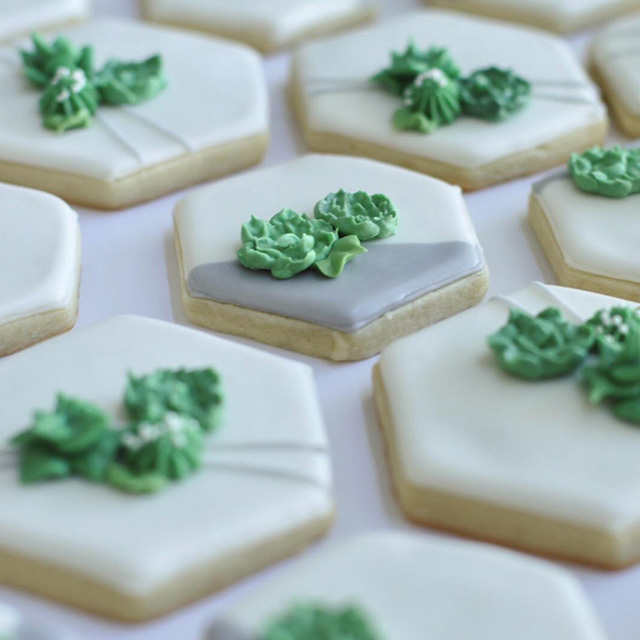 Check out these posts if you’d like some more cookie inspiration! Every time I think you can't POSSIBLY top yourself, I am proved wrong. Happy Thanksgiving!! Stop it Right Now!!! You are too creative!! I miss you guys so much!! Move Back! I LOVE THESE SO MUCH! I only wish I had seen them sooner! Maybe I can pull it off, with all my other last-minute treats:) Merry Christmas!